Take an Elizabethan house (above), add one of the world's most famous wine writers - Hugh Johnson - who has helped people around the world understand fine wines; but is also a man who loves trees; give him 40 years to enhance a landscape, and you end up with one of the finest gardens I've seen in my two years of garden visiting - Saling Hall in Essex. Hugh and his wife Judy arrived here in the 1970s and turned this 12-acre site into one of the most peaceful and reflective gardens that I've come across yet - with a fine walled garden and a wonderful collection of trees. 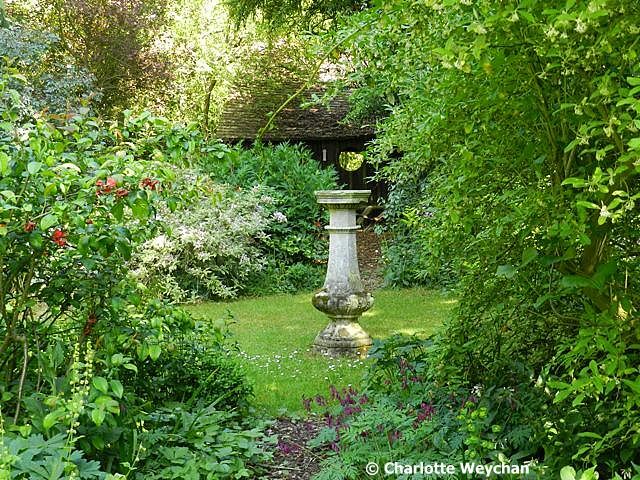 They share this space with visitors throughout the summer months by opening for the NGS every Wednesday afternoon from 2-5 from now until the end of July. I was lucky enough not just to visit on the first open day of the year, but also to run into Hugh Johnson himself, who talked openly about his garden and his love of trees. 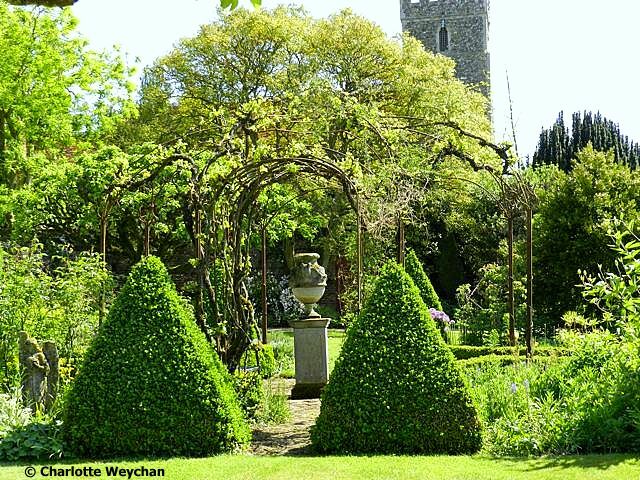 The Johnsons bought Saling Hall from another great gardener - Lady Carlyle - who lived and gardened here for nearly four decades before them, and created the Walled Garden (above) that makes such an impact on first-time visitors. 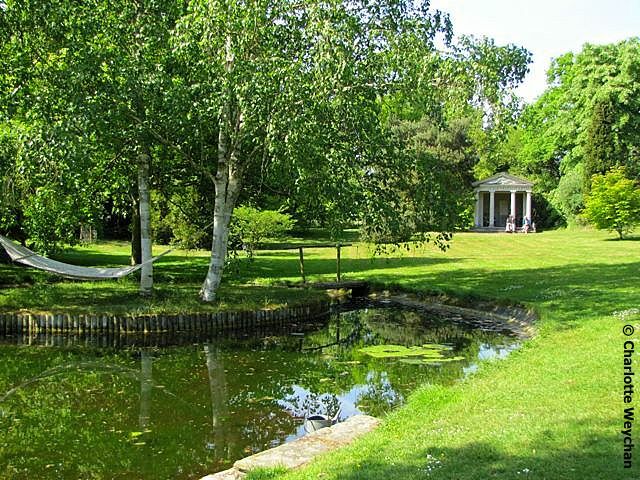 But it is the present owners who have painted the rest of the landscape here and made their own impression on this garden, by planting trees, placing sculptures and adding to the garden they inherited. 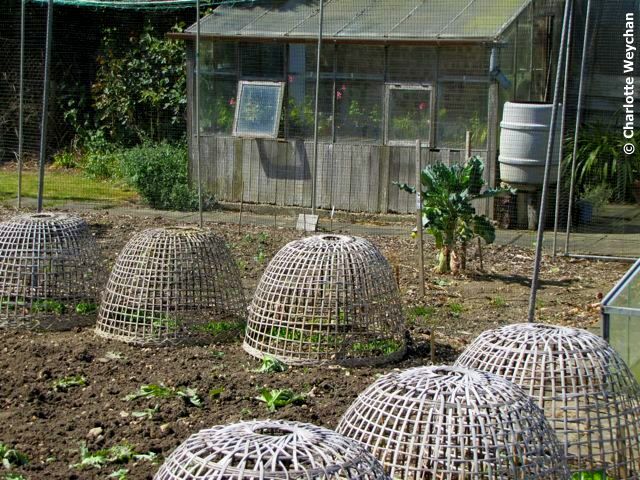 Lady Carlyle had the unusual idea of treating her fruit trees as topiary and trained them into mushroom shapes! The Johnsons have added Irish junipers, box hedges and a pergola to the walled garden area, which comes alive in the spring and summer months, thanks to their careful planting. But lovely as the walled garden may be, with its formality and floral displays, it is the rest of the garden that enchanted me, with the wide open vistas, the profusion of shrubs and the arboretum - all created by Hugh Johnson, who has published several books on trees. He has added a theatrical touch too, with the Temple of Pisces and The Red Sea (below). There is also a Japanese Garden, filled with maples, and carefully placed sculptures and garden ornaments draw your eye to focal points as you wander around. 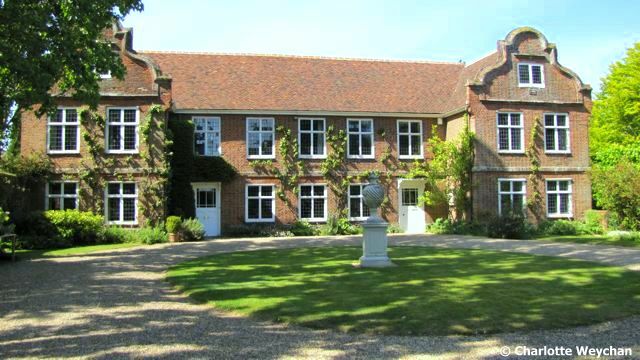 Hugh Johnson writes his own weekly blog called Trad's Diary and you can follow the story of his garden there, so my post only gives you an insight into why you should add Saling Hall to your Wish List. Pictures cannot really do it justice and I urge readers to go and see for themselves why this garden is so special. Johnson also played an active role in saving the Gibberd Garden which I shall be reviewing next. How lucky you are to have meet Hugh Johnson. He is legendary! I didn't know he was a gardener too! I will be checking out his blog and thank you for the tour of Saling Hall. Lovely! So what are the upside down baskets for? support or just aesthetics? Thanks for another great garden visit suggestion! One can imagine a relaxing afternoon on the hammock by the "Red Sea." I will check out Hugh Johnson's blog. Beautiful garden! Are those arbors created from the branches of a living tree?